Not far from the Stour estuary, and within sight of the modern world that is Essex, this sleepy church raises its head above the trees and looks out across the rolling fields. Harkstead is a lovely village; more a scattering of settlements really, like so many on the Peninsula. Away from the village centre, the church is in a quiet lane, surrounded by woodland and meadows, in as lovely a setting as any in Suffolk. The warm colours of the tower betray the fact that, as with many along this coast, the tower is largely built of septaria, the hardened mud found in the estuary mouths of the Suffolk rivers. Unfortunately, septaria becomes friable as the centuries pass; but Harkstead tower still stands, a mark that this is a more sheltered spot than Bawdsey and Alderton, not far off, where the towers succumbed to the elements in the 18th and 19th centuries. In midsummer, the lanes here are wildly hedged, and if you catch a breeze from the river it is a pleasant relief from the high sun. In autumn, the land begins to turn in on itself; back in 2008 I had cycled from Erwarton through the busy harvest being gathered, and coming back here after ten years away I had felt a sense of something ending, of Suffolk beginning to relax and ready itself for winter. And now, another eight years had passed, and it was winter again. Towards the end of November 2016, a beautiful Saturday morning dawned crisp and bright, and so I set off out of Ipswich for a bike ride around the Shotley peninsula. 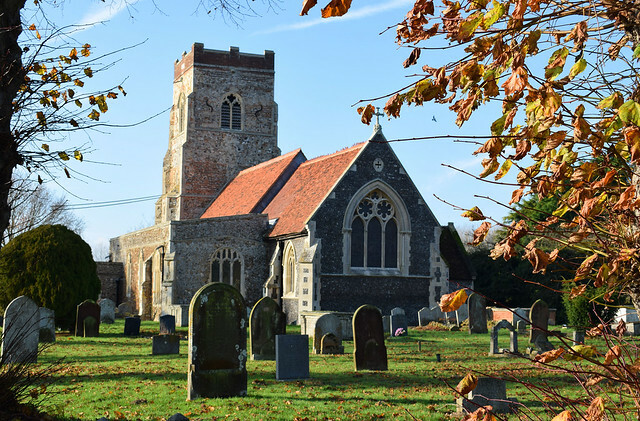 First Woolverstone, and then across to the winding lanes across the ploughed fields, a weasel chattering at me angrily as it ran across the road in front of me, and then I came to Harkstead and its church. The tall graveyard trees were almost bereft of their leaves, just a few hanging on now in the breeze from the Stour estuary. At the heart of it the church, looking all of its 19th Century restoration. In fact, St Mary was almost entirely reinvented during the 1860s. At this time, the chancel was rebuilt, and the fixtures and furnishings replaced with a good example of a Victorian High Church interior. Almost nothing medieval survives inside, but still the feeling is a pleasing combination of the rustic and the triumphant. How wide-eyed the villagers must have been when they saw what their little church had become! Below the remarkably tall tower arch, the font was completely recarved with the typical East Anglian design of Evangelistic symbols and angels alternating on the bowl, and lions and woodwoses alternating on the stem. The Evangelistic symbols hold scrolls with their Saints' names in Latin, a nice High Church touch. Matching it at the east end is the fabulous reredos and tiled sanctuary, the work of Powell and Sons. A lady I met inside joked that it reminded her of the tiles of a public lavatory, but I thought it was better than that, recalling more the high Victorian decoration of those great urban public houses you still find in big cities, with which it is almost exactly contemporary. In 2008 it was still dressed in a flamboyant High Church style. There is an intimacy in seeing this kind of work on such a small scale which gives you a frisson, a sense of the seriousness and ecstasy of the Anglican catholic revival in outposts like this. As the tide of Anglo-catholicism recedes, places like this become a touchstone to our not-so-distant ancestors, and what prayer and worship meant to them. A single medieval survival is the fragment of wallpainting opposite. A batwinged figure appears to extend a ball in its left hand, and for one moment I mused that this might be the medieval occasion on which Ipswich Town Football Club sold their souls to become more successful than they ever had a right to - but then, I'm a Cambridge United fan. Perhaps it is really part of a 15th Century Warning against Gossip. Thirty years ago I had friends who lived in Harkstead, but over the years we had lost touch. As I was exploring St Mary in 2008, an old lady came in. She stood down by the west end, leafing through the visitors book, apparently reading the comments. I went and asked her if she was from Harkstead. "Oh yes, dear, I'm from Harkstead!" she replied fervently. I asked her if she knew my friends, and if they were still living in the village. She thought for a moment, and then said "sorry, dear, but..." It turned out that she had left the village in 1939 to go and work in Ipswich, where she now lived, and had never moved back. But she still came to visit Harkstead at least once a month, and always visited the church, and knew that one day she would be buried in the soft ground around St Mary. I thought that this was beautiful, and it told me pretty much everything I needed to know about the parish of Harkstead. Coming this way in the late 1990s, I arrived a few months after Harkstead had lost its village shop and its post office. Local people were fighting to keep their pub. I wondered then if villages like this were in danger of becoming rather pretty ghost dormitory villages, for professionals working in Ipswich. Would their churches lose their central role in the lives of the villages, I wondered? Coming back, it is good to see that the Bakers Arms is still thriving, although it now seems extraordinary that Harkstead had ever had a village shop or a post office. But the church is still open, and there is still a feeling that St Mary is at the heart of a living community. It is easy to indulge yourself with the adjective timeless when you stand in a church like that of Harkstead. But it wouldn't be true of course, and change and decay in all around I see, but after all, part of the beauty of our ancient churches is their sense of continuity and change. And how will our communities survive without change? Harkstead may not. But I like to think that there is something timeless about this gorgeous setting, and that the pattern of summers, flickering again across its high trees, and the winters with their skeletal trees, ploughed fields and weasels, is one that would be recognised by the ghosts of passing generations.